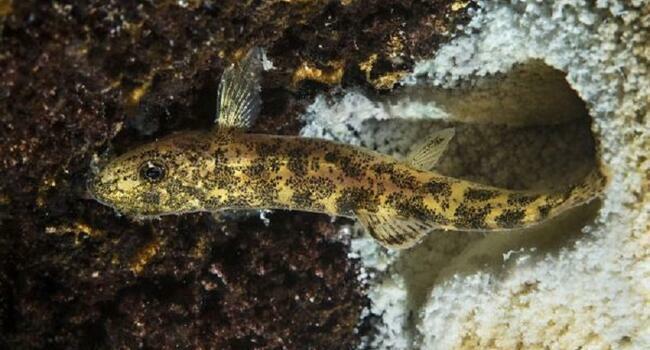 Researchers have been surprised at a recent discovery of a five- to six-centimeter-long fish species in Lake Van, the world’s largest salty and soda lake in the eastern province of Van, by a gendarmerie underwater team. Works have been initiated to determine the species of the fish, which are living in a 13-meter-high microbialite — carbonate rock structures formed by bacteria and algae and can be up to 10 meters high — and discovered during a diving of the Provincial Gendarmerie Commandership Underwater Team. A team of six experts were formed by the Yüzüncü Yıl University (YYÜ) to identify the habitat areas, populations and nutritional conditions of the black-spotted yellow fish species that were found for the first time in Lake Van, which is known to be home to the pearl mullet only. The team members, including the dean of the YYU Faculty of Fisheries, Professor Fazıl Şen, and Kastamonu University Dean of Faculty of Fisheries Professor Mahmut Elp, dived into the lake to reveal the other features of the fish species living in the fresh water inside the microbialites. The team, which took samples from the water surface, the microbialites and fish for examination in the laboratory, said it was surprising that the fish did not leave the microbialite and lived in the narrow space inside. Speaking to state-run Anadolu Agency, Şen said they made a general examination on the living environment of the fish species and the features of the water and stressed they would work on the samples in a laboratory. “We have started the study because the fish live in the fresh water inside the microbialite in the salty and soda lake, and this is very interesting. This is very similar to a type of freshwater in this region. Therefore, we don’t know yet if it can live in the Van Lake or not. We will get information about it in the laboratory. We are trying to figure out how these fish keep a generation in a narrow space, because that’s fascinating. We took water samples from microbialites and areas where the fish live. From these examples, we will try to see what limits the fish can reach in Lake Van,” Şen said. Elp said they dove into the water in order to examine the fish species, getting the chance to see the living space of the fish and to record it. “The fish settled on microbialites. It is very interesting because they never leave the microbialite. They have no air bladders as rock fishes do. We were expecting to see an air bladder covered with small bony capsules in these fish,” Elp said.